Pro-level audio input mixer app for Mac is useful for musicians, DJs, audio engineers, and podcasters. If you’ve ever used a app that accepts an audio input and was frustrated that you can specify only one piece of audio hardware, or if you’ve wanted to route the sound output of an app into a Skype, FaceTime, Google Hangouts, or other conversation, Rogue Amoeba’s Loopback is the program you need. The latest version improves significantly on its predecessor, which itself was quite powerful. 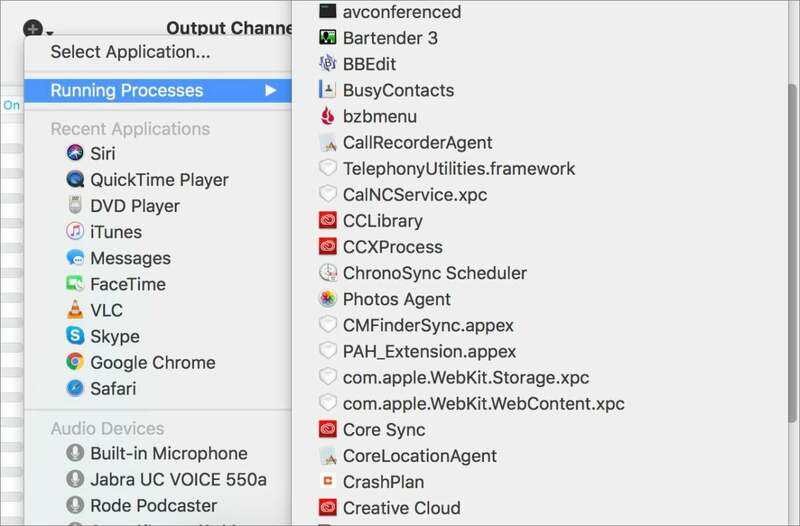 A typical configuration lets you route the output of multiple apps into a single device that you could use to record or pass to another app. The app lets you combine hardware audio—like mics and line input—with the audio output of apps and system-level components, like Text-to-Speech, to create virtual audio devices. A combined audio device appears as a single item you can select as an input in programs like GarageBand or Skype. You can also select it as an output device, too, playing into the virtual audio equipment system audio or the sound out of apps that allow audio output selection. Version 2 simplifies the previous interface, making it easier to connect audio sources and providing you a better view of how you’ve configured a virtual audio device at a glance. It also adds volume controls for every component in an audio workflow, which lets you really mix the sound together instead of have to control it from the source—often not a possibility—or dealing with out-of-balance levels. You can even capture Siri talking. Loopback can be used in both extremely simple and complicated ways, and it benefits from practical examples. Here are a few. Taking the output of a tab in Safari that’s playing cable channel news and recording it through QuickTime player. With multiple USB mics attached, combining their input to feed into a FaceTime call. 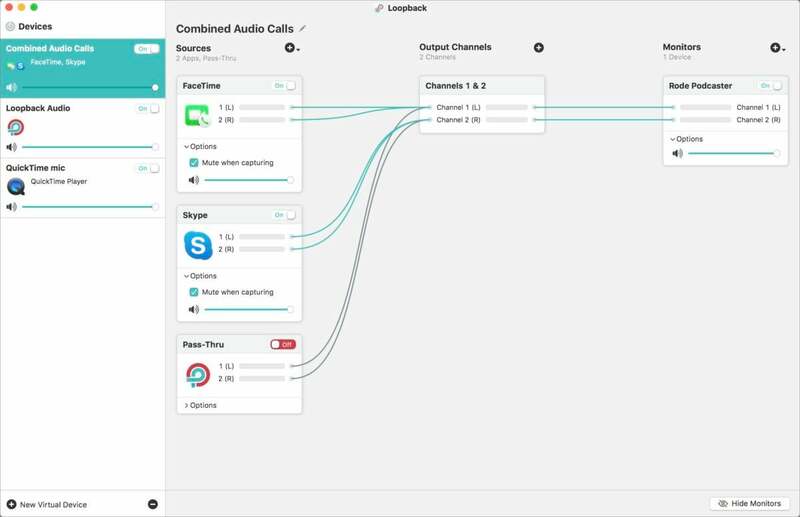 Managing a call with people across multiple internet audio apps, like audio calls within Slack and Google Hangouts, so that you and everyone can hear each other. On a podcast with remote guests, where you want to have background music, live music, or snippets play during the recording that everyone on the connection can hear just as you can. That scratches the surface. But if none of these uses remind you of tasks you’ve tried to manage or want to do, Loopback likely doesn’t meet your interests. An Option-click gains access to everything running on a Mac, including hidden agents. Every new device automatically includes Pass-Thru, which lets it be used as an audio input as well as a combined output, useful for apps that let you choose a specific audio output device. For example, you might want to dump the output from an audio editor program as the input of a Skype call, so someone else could listen to changes and approve them as you edit. 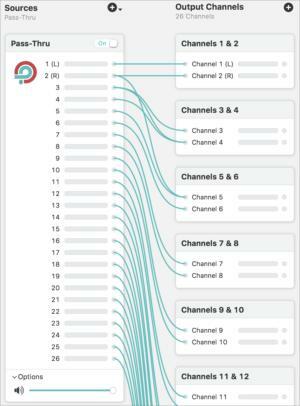 I’m sure some folks need this many channels, and if so, Loopback is there for them. Loopback 2 supports up to 64 channels of passthrough audio, letting you take up to 64 input channels (32 stereo channels) and pipe to any combination of up to 64 output channels. That is a heck of a lot. The previous limit was already quite high at 32, and clearly some users asked for more. With large recording projects using a lot of mics or other sources, Loopback could allow a producer or mixer to bypass more expensive software. You can monitor outputs, too, which is useful when you’re plugging them into places that aren’t playing the results as well, or where you want to listen to a combined set of audio without routing it to a program. You could pipe simultaneous calls you linked together, as in one of the above examples, and then use a monitor to listen to them all on a headphone output. The graphical approach in version 2 lets you drag output connections almost like you’re grabbing audio cables and plugging them into different jacks. This can get a little tricky in three ways before you get fully used to it. First, you always drag a new wire from the output channel “jack” of a source to an output channel, or from an output channel to a monitor. You cannot drag to move the link from an input side, which seems like a logical and intuitive action—except it isn’t supported. Second, you can route an output to multiple inputs, dragging repeatedly from the same output jack. But dragging a new “wire” doesn’t re-reroute existing connections, even though that might also seem logical. Third, to avoid accidental deletion of audio routing, when you select a route and it highlights by thickening its line, pressing Delete on its own doesn’t remove it. Instead, you have to use Command-Delete. Loopback pairs neatly with two other Rogue Amoeba products: Audio Hijack ($59), which has a few feature overlaps, and Farrago ($49), a soundboard that lets you store and play sound effects and audio snippets. Audio Hijack includes recording and effect options, and is aimed more at a front-to-back audio-capture process. Loopback makes it easier to create and control sets of devices to feed into Audio Hijack, however, and make them available systemwide. Farrago can be just another sound source into a Loopback interface. Rogue Amoeba has two bundles that reduce the cost: Loopback and Audio Hijack for $130 and those two apps plus Farrago and its Fission simple audio editor for $175. Loopback 2 offers significant improvements over the initial release across the board, even though version 1 was quite useful and good. The interface change to allow a more visual drag-and-drop approach helps considerably, as does exposing Pass-Thru as yet another element in sources. The addition of volumes controls for setting balance is completely invaluable. Apple didn’t include robust audio routing and mixing controls in macOS, and it’s hard to blame the company for that, because only a small subset of Mac users need them. Loopback bridges that gap, although its $99 price tag aims the product at audio professionals, podcasters with a budget, or business users. It’s not a casual tool, but it can be vital and affordable for those for whom this review left them pumping their fists. The simplicity of version 2 of Loopback makes it even easier to access its powerful features for combining and controlling audio sources, including the sound output of apps.